A professional couple with two young children decided that they no longer wanted to live in the past — well, at least in a certain bygone decade. They loved the ornate Victorian exterior of their home in the leafy Melbourne, Australia suburb of Malvern, but the 1980s addition behind it had zero character. So when they hired Kathryn Robson and Chris Rak of Robson Rak, they asked for the team to build a modern extension that would complement the property's original architecture and better connect the spaces to the outdoors. To do that, the firm created an airy floor plan that hints at the front facade's color and detailing with brown brick and warm timber paneling. The extension's fireplace — which is visible from the front door — is designed to be a central axis of the new space, and its accompanying glass bi-fold doors open the kitchen to the terrace and pool area. Now the space represents the past and the present, all so that the family can see their future here. 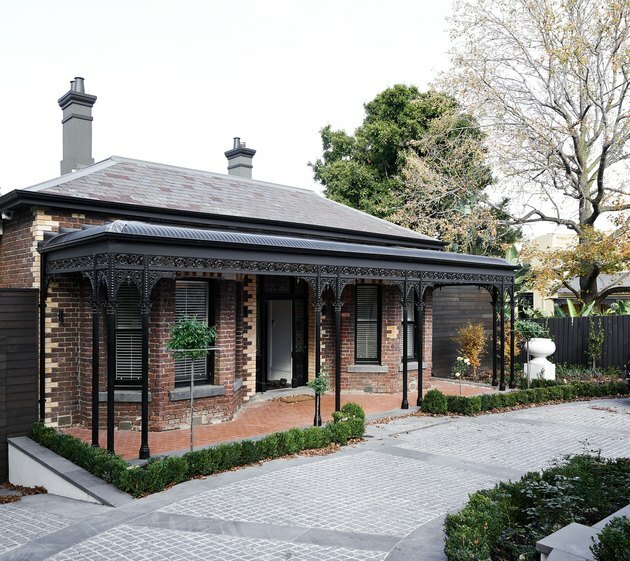 The facade's brick and metalwork were restored to bring out the home's period beauty. 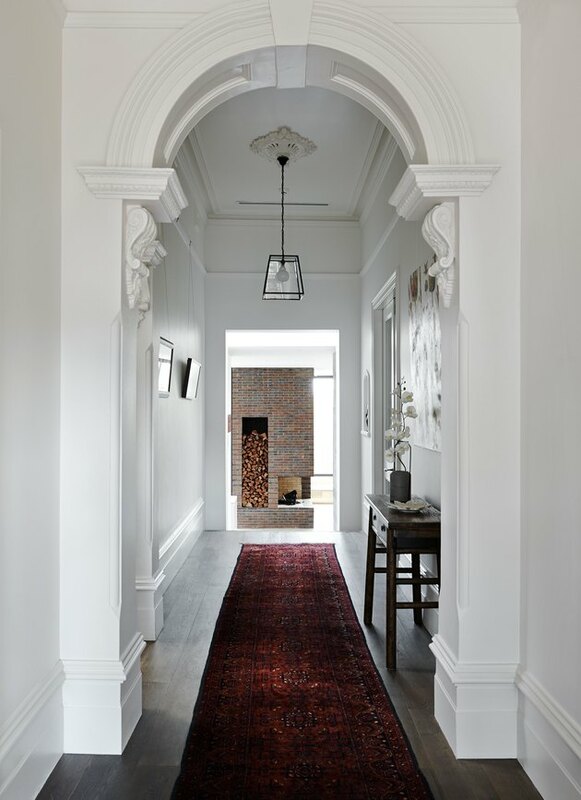 The center hallway leads to the addition and offers a view of the fireplace. "The brown-brick fireplace is a constant reminder of the brick facade of the Victorian house," Robson said. Dark oak paneling lines the sitting and dining areas of the extension. The same material was used as flooring in the original section, creating a connection between the two spaces. 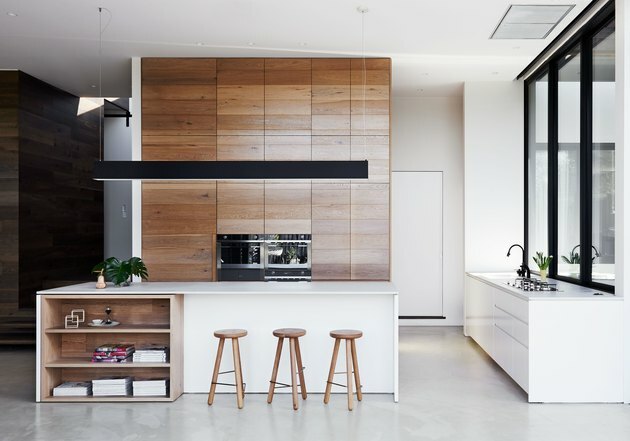 Light oak and reconstituted stone were used in the sleek kitchen. "A concrete floor helps define the new extension but also allows the dark oak, light oak, and brown-brick fireplace to co-exist within the same space," Rak explained. 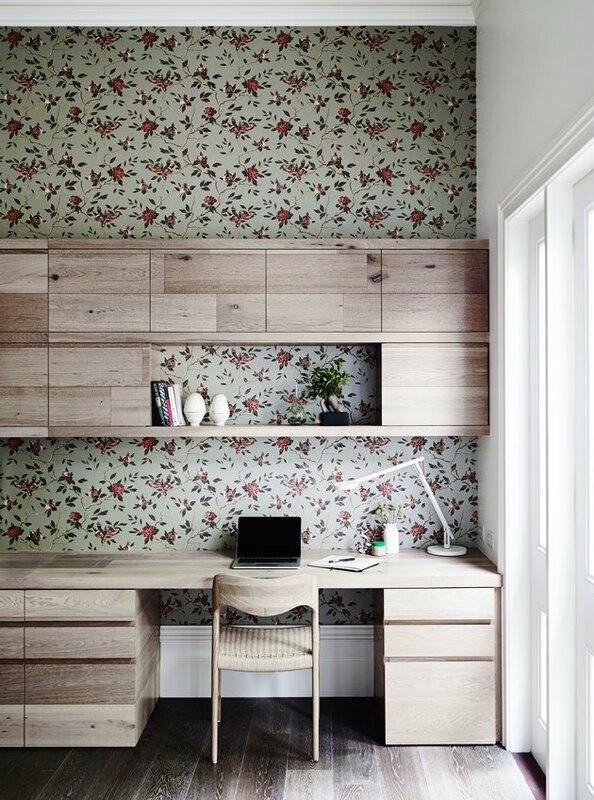 A cheery floral wallpaper brightens the study, where built-in desks and shelving create a picture-perfect spot for homework. 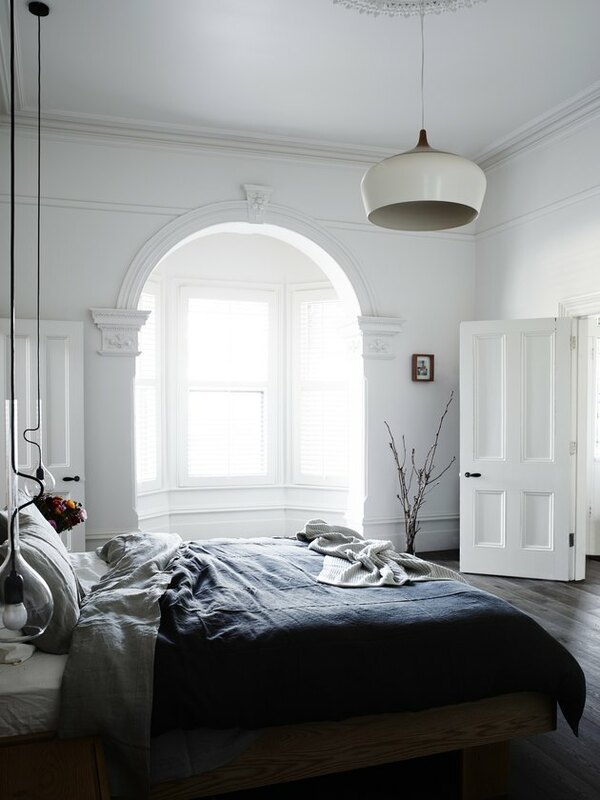 A bedroom in the Victorian section of the home is updated with dark oak floors and modern pendant lights. 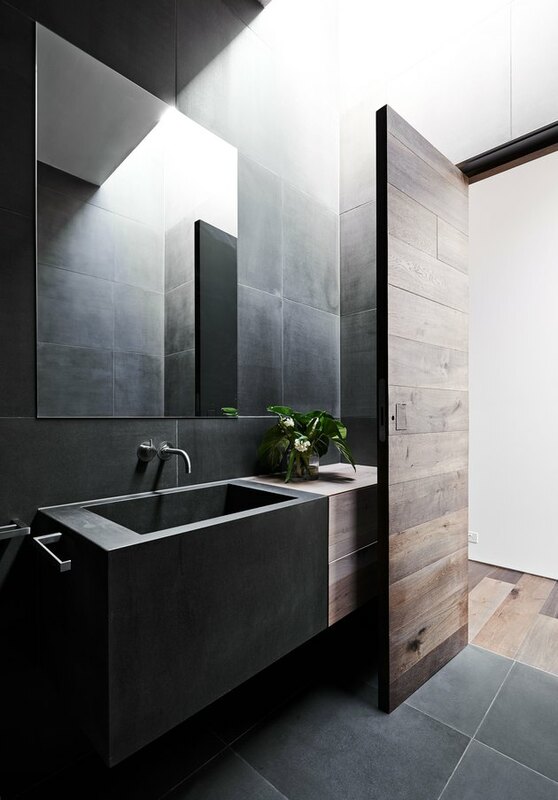 The architects used bluestone for the walls, floors, and basin in the skylit powder room. The kitchen's glass doors open onto an outdoor dining area. The house has been fully automated, although the architects were careful to disguise the high-tech features using the same organic palette. 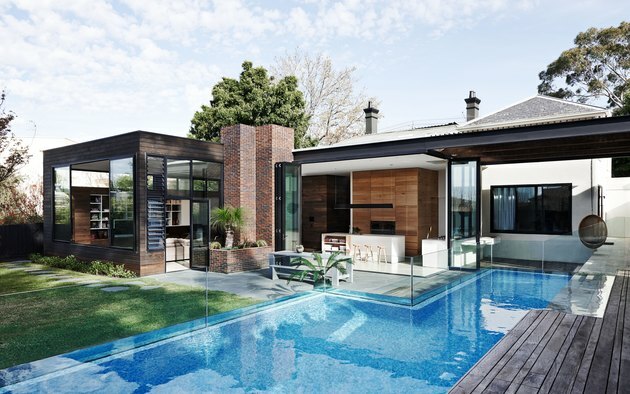 A glass partition separates the pool from the terrace and yard.